The world produces 20 to 50 million metric tons of electronic waste every year. However, we recycle only 12.5% of that shocking number. With the emergence of the digital revolution, matters have become worse in more recent years. This problem is gradually turning into a global epidemic. In America alone, e-waste makes up 2% of the trash in the landfills, but that also equals 70% of the country’s toxic waste. Each year, it becomes more evident that these devices pose an environmental risk. As a result, the world is clamoring for innovative solutions to handle the massive growth of electronic waste. Communities worldwide are now responding by recycling. Electronic Waste, also known as e-waste, refers to an ever-increasing stream of discarded appliances and gadgets. Computers, smartphones, televisions, and washing machines are some of the devices that make up e-waste. Most of the electronic devices that get disposed aren’t damaged or unusable. These items are more often thrown away because they are dated. E-waste recycling enables communities to recover precious metals found in the discarded devices. It is estimated that electronic waste holds precious metals that are 40 to 50 times richer than what we mine from the earth. Gold is one of those metals. However, only 10 to 15% of it is successfully extracted from these devices. Apart from that, recycling helps communities ensure that the toxic chemicals contained in electronic devices won’t seep into the environment. Chromium, lead, mercury, and cadmium are some of the toxic substances found in old devices. How Can Consumers Recycle Electronic Devices? The popularity of electronic devices has spawned a new industry focused entirely on recycling these discarded gadgets. Back in 2012, the global recycling market was worth $9.84 billion. That number is expected to grow by more than 20% by 2019. There are plenty of e-waste recycling opportunities these days; however, it may depend on where you live. If you can’t find authorized electronics recyclers, you can choose to donate dated computer equipment that can be reused or refurbished. Recycling is the best solution to the world’s e-waste problem. However, it has spawned new issues related to data security and privacy. E-waste recycling is necessary, but you have to be cautious. The laptops and smartphones you dump contain private data—passwords, bank details, home addresses, contacts. When these fall into the wrong hands, you could face devastating consequences. It’s quite easy for anyone to extract personal data from electronic devices. Dragging your important documents to the Recycling Bin won’t be enough to keep your data secure. That’s because digital information often leaves a trail of breadcrumbs that can be recovered effortlessly using the right hardware. Unwanted electronic devices go through several hands during the recycling process. They are dismantled piece by piece by authorized professionals at different facilities. That means there are plenty of opportunities for your information to be stolen. But there is a way to avoid this from happening. How Can Consumers Secure Their Date When Recycling? First, make backups of your old data. 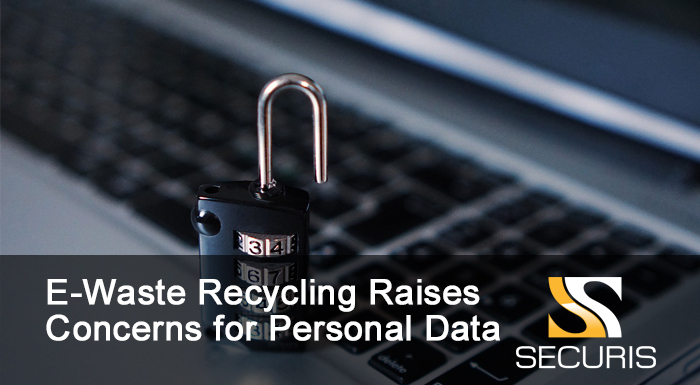 Once backups have been made, you can now wipe out private information stored in the device you will be recycling. Smartphones don’t often come with traditional hard drives. That means all you have to do to get rid of the data is to find the reset function. As for PCs and other devices that have a hard drive, the easiest way to destroy private information is to have the hard drive shredded. There are authorized recycling firms who can destroy all drives for you. They will place your devices into a shredder, making it impossible for anyone to recover any information from it. You don’t have to compromise your data to care for the environment. As long as you make an effort, you can keep both your private information and your community safe. If you’re looking for reputable e-waste recycler to help you dispose your electronics securely, contact Securis today and we’ll be more than happy to help.